Last edited by thirdgenbird; 03-27-12 at 08:32 PM. Last edited by gomango; 05-12-13 at 07:46 AM. Last edited by Andycapp; 03-18-12 at 11:17 PM. Location: Hervey Bay, Qld, Australia. Bikes: Colnago (82, 85, 89, 90, 91, 96, 03), 85 Cinelli, 90 Rossin, 83 Alan, 82 Bianchi, 78 Fountain, 2 x Pinarello, Malvern Star (37), Hillman (70's), 80's Beretto Lo-Pro Track, 80's Kenevans Lo-Pro, Columbus Max (95), DeGrandi (80's) Track. Oh yeah! I'm just sitting back, lounging, and enjoying. Thanks fellas. 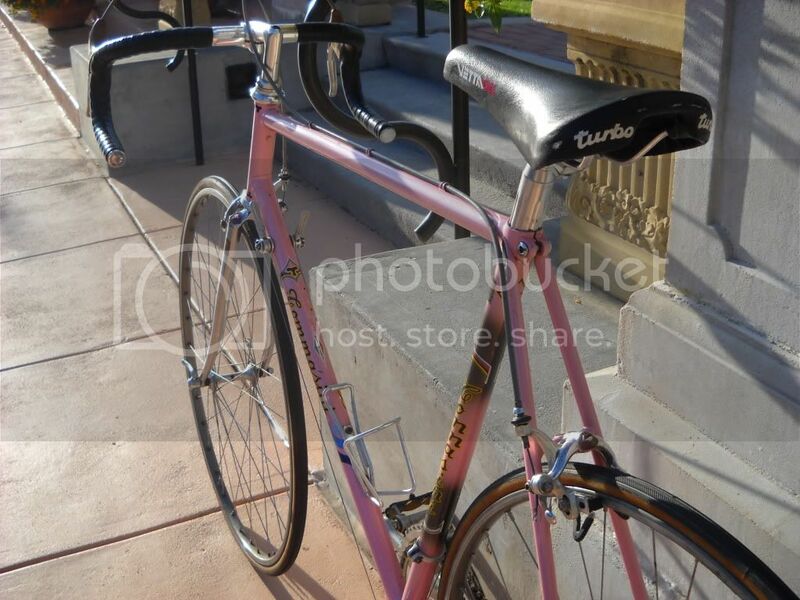 Of course my New (vintage) pink stallion! I went on a 14 mile ride after work on my "Rosita" today! I fell in love with the spectacular ride. One word "Italian"! My favorite pic so far! WOW... amazing bicycle there. I will have one someday as well. They were always one of my favorites. Perfect bicycle you have there young man. Makes me want to strip the DA and start over again on mine, but way too many irons in the fire at the moment. It will just have to do. i know you have 10spd campy bits hidden all over the place. give me a swing at it over easter. i can probably get her straightened out without leaving your property. Andy/Go, beautiful bikes! I love the chrome, but the bikes as a whole are incredibly pretty! Highly tempting if I don't sell her first. Although, another way to think of it is you'll always have a decent bike to ride in the Twin Cities w/o having to drag one along when you visit. Ze, thank you, and I know that you will have one very soon! I seriously began to desire and dream about one a few months ago, and mine became available in my own back yard! Never under estimate the law of attraction! Yours is on a special level like the other beauties posted by TGB and Andy. Saw one just like yours though in Verona two summers ago. Might even have a pic somewhere here. I'll take a look after the kids go to bed. That pink in person is amazing! You are knocking me out with an EL-OS Tommasini Tecno. Very well though out build, no doubt. What tires are those if I may ask? Good golly, I can't go anywhere w/o my readers. Fwiw It certainly looks like I have the ragamuffin of this bunch of hot rods. Ref the Tommasini Tecno- the skewers are correct, they are just very curved. The tyres are Stelvios-but since I took the pics I've changed over to Fortezza Tricomps which are also very good (the stelvios passing over to a Bioracer Stephen Roche EL OS framed bike I also own). For me, Irio Tommasini is the best steel frame maker.Interesting that thirdgenbird and myself took similar approaches-hope you enjoy riding yours as much as I do mine! I really wish that I could join this party - I'm enjoying watching from the door. BTW - Mutleyone OWNS this lounge. Not for everyone though Aaron. MAX is fantastic, but doesn't necessarily trump EL-OS for me. It certainly does trump my humble SLX Sintesi though. Mine makes a heck of a loaner bike though, and may be one of the nicer rain bikes around. my dad has the same jersey. when he gave me the frame he said he wanted to hang onto it a bit. i think his is a size or two larger and probably too large for me.